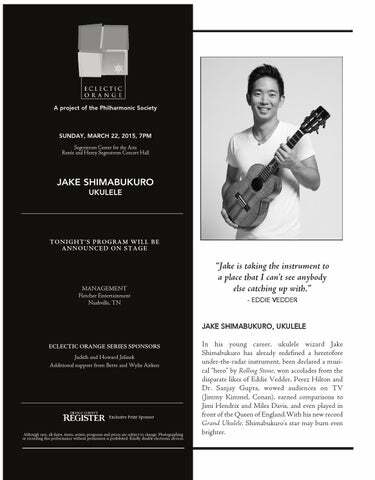 In his young career, ukulele wizard Jake Shimabukuro has already redefined a heretofore under-the-radar instrument, been declared a musical “hero” by Rolling Stone, won accolades from the disparate likes of Eddie Vedder, Perez Hilton and Dr. Sanjay Gupta, wowed audiences on TV (Jimmy Kimmel, Conan), earned comparisons to Jimi Hendrix and Miles Davis, and even played in front of the Queen of England.With his new record Grand Ukulele, Shimabukuro’s star may burn even brighter. include originals like “Island Fever Blues,” a beautiful and traditional Hawaiian song titled “Akaka Falls” and a unique track called “Missing Three,” performed with only three strings—an entire song created during a day when Jake was missing the third string on his instrument. 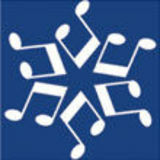 Given that Shimabukuro first won acclaim for a YouTube video of him covering George Harrison’s “While My Guitar Gently Weeps,” it’s no surprise that Grand Ukulele features a number of wonderful reinterpretations, including Sting’s “Fields of Gold” (with Parsons cameo-ing on keyboards) and, most prominently, Adele’s “Rolling in the Deep,” a seemingly ubiquitous song given new life on the four-string. “That one is fun to play,” says Shimabukuro. “I visit schools in Hawaii because I love sharing my passion with kids, but I don’t necessarily play all original pieces, because the kids may not recognize them. So when I cover a popular tune like ‘Rolling In The Deep,’ they really respond!” This fall Jake will embark on a 30-plus city tour, performing solo for the most part. “Someday I’d love to tour with a full orchestra, but these solo shows will be fun, especially since we arranged them so the new songs can stand on their own,” he says.